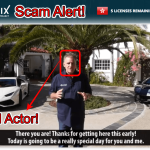 OneTouch Trade Review - Another Scam System? Yes! Chances are you are also one of them who love numbers. How did we know? Well, traders or investors are generally found to have love for numbers. Doesn’t it get a whole lot lovelier if there are large numbers all over our bank statements. Yes, indeed since it would mean that you are playing in big money. You are not alone as Jeffrey Peterson too loves numbers. Are you looking for unbiased OneTouch Trade review? Come we’ll review One Touch Trade and see how Jeffrey made it big with numbers! You have landed on our blog just to check on whether what Jeffrey just told you is true or not. Come let us analyse what all is shown in the pitch video of OneTouch Trade and what all is hidden below the sheets. Jeffrey alights from his Hummer and starts to strum a song whose lyrics reminds me of my counting days. Anyways, on a serious note, he introduces himself as the live example of how one can make money using this profit spinning app. We hear him say that making $6000 in just a few hours is just a casual profit that this app is capable of. Having made over $7,00,000 in just under a year, Jeffrey is having a time of his life. Driving costly cars, living in a sprawling mansion with a pool filled with water and cute girls. Why can’t you make it happen in your life too? What is stopping you- We’ll answer this shortly. We are told that OneTouch Trade is a fully automated service which has garnered a whopping 12,428 user base worldwide. 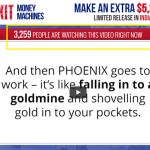 From the moment you activate it, it gets down to work and starts making profits for you. Created by Gold Campbell ltd. , OneTouch Trade is designed to ‘put you to the front row of the market’. We are told that the OneTouch Trade software has an inbuilt history feature. This feature tracks and records the trades it performed on behalf of the thousands of users who have used it. Its like a self improving feature which has enabled the software to greatly better its own record of 75% success rate to 85% now. As always, we also get to use OneTouch Trade software for free and thats just about it. Use it and become rich by investing a minimum amount of $250. 24*7 customer service support is also available. Whenever a product assures of too good to be true returns, be it $6000 or $2000/day or any other handsome amount- beware! No one just no one can justify that claim while trading in Binary Options. So, looking at the 7 Hundred Thousand Dollars that Jeffrey claims to have made for himself, we are quite satisfied that OneTouch is yet another scam. There is no mention of the people incharge of this app. Who is driving the show in the background is just not known. What brokers would our investments be handed over to? What are the credentials of those brokers? Are they regulated or not, does any goverment agency oversee their opearations at all? All these questions demand answers. We are suspicious not just by the wild claim of making enormous money, but from the testimonial photos too. We have struck truth in digging out a new finding. 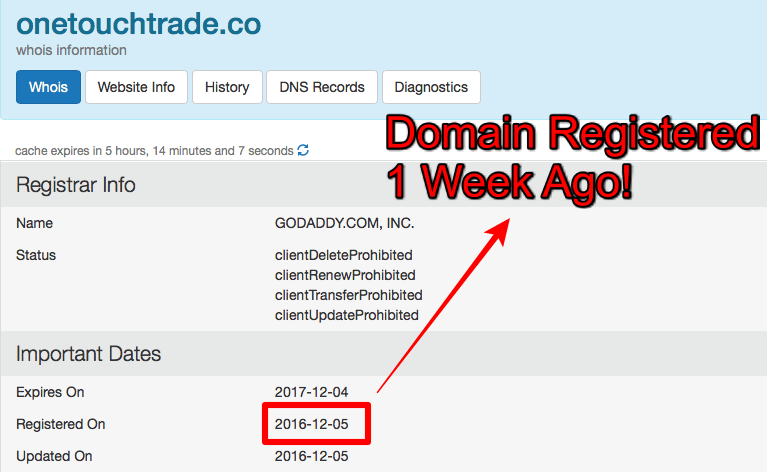 The domain age is just a few days old. You can check it on whois.net and see for yourself. This puts a shadow of doubt on the premise that over 12 thousand users are using this software worldwide. How can a website so very new mop up such a customer base? 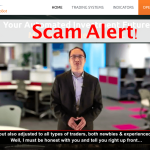 One of the few faces used in testimonials on the official website of OneTouch Trade scam has been taken from stock picture sites. A website which can’t even put a few genuine ‘earners’, what do you make of it? Scam? Yeah thats most probably correct. In all likelihood, OneTouch Trade is not a bonafide software. Given that its very new in the market and there are no concrete evidences to prove its ingenuity, we would suggest that you do not be rash in putting your money on them. 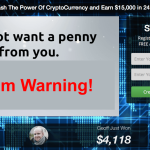 From the initial looks of it and by virtue of whatever oddities we have pointed out above in our review, it looks like a big scam in the making. You must been inundated with a flood of emails or invites on Facebook or google ads. Exercise caution and do not get carried away with cherry topping promises. 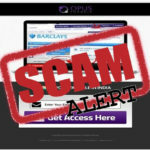 Verdict – Stay Away From OneTouch Trade Scam! Every new software tries to bring out something unique with it. Some are genuine when they speak of novelty while others just spell out tongue twisters. With fancy sounding algorithm names and hyped up statistics, they try every tricks in the book to lure you. Once you are in their grip, they can constrict you and twist you in whatever way. Always make yourself sure while venturing out to invest in Binary Options Apps. 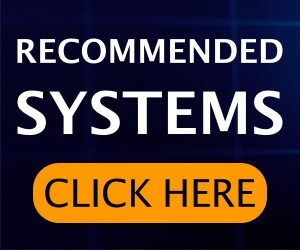 We try to review every new software product that enters the Binary Options Trading horizon. Do visit our blog before making up your mind to invest through an App. Chances are we have a review ready for you! Don’t forget to subscribe to our e-mail newsletter to get latest updates about trading robots.